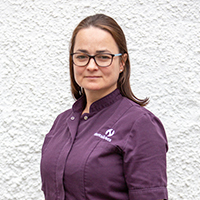 Lesley joined the DentalVets reception team in July 2017. She spent the majority of her career working in the property/estate agency industry within a leading firm of Edinburgh solicitors. Following this she retrained in 2009 as a beauty therapist. Joining DentalVets has been a interesting new challenge. She is a true native of East Lothian and was educated at North Berwick High School. She lives locally with her family and spends the majority of her spare time with her daughter and dog caring for two ponies which they share with Muirfield Riding Therapy at West Fenton.